1. d4 Nf6 2. c4 e6 3. Nc3 Bb4 The Nimzowitsch Defence. 4. Nf3 b6 A new system for this tournament! 5. 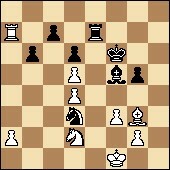 Bg5 We’ve ended up with a known hybrid of the Queen’s Indian and the Nimzowitsch Defence. Both sides in unison use their bishops to attack the knights, which are fighting for the key e4 and d5 squares. 5…h6 6. 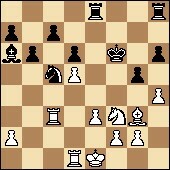 Bh4 g5 A sharp continuation. But here he manages. That’s important. 8. Qc2 Bb7 Black should support the advanced knight for as long as possible. And if it has to be exchanged, then better for the bishop on g3. 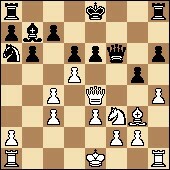 9. e3 d6 The path for Black’s second knight is via d7. 10. Bd3 Hikaru is increasing the pressure. 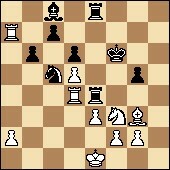 11. bxc3 f5 The proud knight is still maintaining its high position. As you can easily guess, for now nothing new has happened… Nakamura’s thinking for a long time, despite this only being an opening tabiya, known since the middle of the last century. Lots of games have been played here! 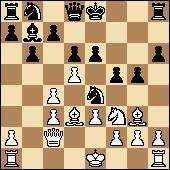 The most interesting approach is the 12. d5 blow. But the question is, did the American prepare it this morning? If not, then it’s worth refraining from it. The clock situation speaks for itself: 1:20 – 1:40. He’s gone for it! Well done, Hikaru! He really is a noble fighter. The move intends to destroy the beauty and harmony of Black’s pawn structure. It’s very important that the white knight gets to d4. 12…Na6 Military cunning – the second black knight is setting off to help the first. 13. h4 An amazing novelty! It wouldn’t enter into my head to weaken the kingside like that – after all Black can take on g3 and spoil White’s structure. 13…Qf6 Common sense and a practical manner of conducting the struggle are distinguishing characteristics of Anand’s. He replied quickly and sensibly. Black has to develop. If Black was willing to sacrifice the e4-pawn a move ago, then why not also sacrifice it now, in an even more advantageous situation? Castling long has already been prepared. The exchange on g3 remains in reserve. 14. Bxe4 The sacrifice is accepted. Boldly played! 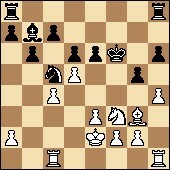 The c3-pawn is offered up on the altar of the attack. Along with the safety of his own king. 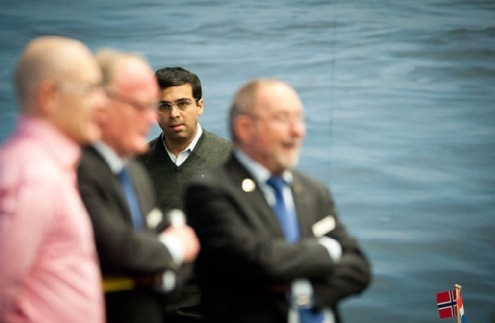 Vishy is spending a long time analysing the position. He’s thinking: “To take or not to take?” (Translator’s note: in Russian “to take” (literally hit/beat) here sounds very similar to “to be”, especially if they’re pronounced by a non-native speaker…) Fortunately, he has plenty of time for now: 1:10 – 1:18. By the way, via a different move order we’ve returned to a position that’s been tried out in practice! It’s as if after 13. Bxe4 fxe4 14. Qxe4 Qf6 White played 15. h4 instead of the usual castling short. Well then, a true novelty still lies ahead. 15…Qxc3+ He took it! Anand found the correct response to the eternal question. Now that is a novelty! 16. 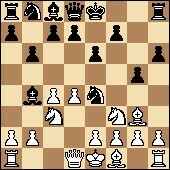 Ke2 Otherwise you can’t save the a1-rook. 16…Nc5 With knights on the board the situation is extremely tense. It’s not often that you get to see a middlegame in which both kings have advanced so symmetrically – under enemy fire. It’s a beautiful position! Worthy of a diagram. The first impression is that Black, at worst, is fine, while I wouldn’t vouch for White. His minor pieces are passive, and the king’s threatened by all sorts of checks, for instance from c4. In terms of time expenditure the players are working in symmetry: 1:04 – 1:08. 18. Rac1 The fruit of long doubts and torments. But nothing better was visible. 18…Qf6 Played in an extremely straightforward manner. 19. Qxf6+ You have to enter a worse ending. 20. 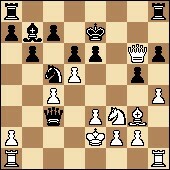 Rhd1 Stubbornly trying to hold on to the d5-pawn. But using your hands to hold on to the cork of an almost open bottle of champagne is not an enterprise lacking in risk. It can burst open at any moment. 20…exd5 Vishy clarifies the situation. 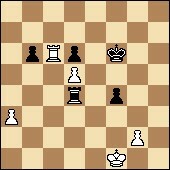 21. cxd5 The drawback of the pawn exchange is that now the c5-knight is using its puny body to protect the c7-pawn, so it can’t go on the attack itself, let’s say to e4. In that sense, if you go back a little, the prophylactic 20…Rh7 would have been good. However, it still won’t be bad in future. Nakamura isn’t going to offer an exchange sacrifice twice. The rook takes up a good defensive position, but won’t be against taking a bite on c7 or a7, if the chance arises. Let’s look at the clocks: 0:47 – 0:36. 23…Re4 The black rooks also weren’t born yesterday. One’s now heading for a4, and it’s unlikely the other will stay on the sidelines. 24…Rhe8 A natural, but not an only move. 25. Ra3 Hikaru is also playing logically. Now both of his opponent’s pieces are hobbled. Although it’s not clear what White can play next, Black also doesn’t have an abundance of active ideas. 25…Bc8 A surprise! It turns out that Anand doesn’t pity the a7-pawn at all – it’s the high price he’s willing to pay to activate his pieces. But for now analysis doesn’t show any positive lines for Black. It seems you can and should take the bait on a7 – otherwise Black plays a7-a5! and White’s active ideas dry up for good. 26. hxg5+ This move is essential – you have to free the h4-square for the bishop. 31.Nb5 Rc2+, and there’s still the fear that in a struggle on both flanks the bishop might prove more agile than the knight. 27…R8e7 An instant reply. Black isn’t giving up the c7-pawn. For now he’s a pawn down, but in future he’ll have the chance to get even with White. The bishop on g3 remains just pointless decoration. No active ideas are visible. 28. Kf1 Getting out of a dangerous line-up with the rooks. 23…Bg4 Black is revealing his aces. He’s threatening destructive exchanges on f3 and d4. 29. Nd2 The only possibly reply. 29…Rxd4 30. exd4 The number of weak pawns in White’s ranks has doubled. 30…Nd3 31. f3 But the g3-bishop is showing signs of life. And though for now it’s far from achieving the title of active piece, it fulfilled a most important function – it didn’t allow mate on e1. 32…Nf4 There it is. The drawback! Black’s ready to infiltrate with his rooks on the second rank – with the help of the preliminary move Bf5-d3. The rook on a7 is out of play for now. Piece coordination – that’s what White lacks, while Black is absolutely fine in that regard. 33. Bxf4 Yes, it’s no regret to exchange a bishop for such a knight. Particularly a bishop like that – which has stood idle for half the game. 34. Ne4+ There’s no other means of preventing the infiltration. But you don’t need one. White is successfully defending. 34…Bxe4 35. fxe4 Rxe4 Vishy decided not to complicate things unnecessarily. Exchanges are inevitable. The game is rapidly heading for a drawn outcome. 37…Ke5 38. Rxb6 Rd1+ 39. Ke2 Ra1 Played according to theory. The rook should stand behind your opponent’s passed pawn. 40. Rb3 Kxd5 The time control has passed. Let’s drink our traditional cup of coffee and examine Black’s edge under the microscope! 41. g3! Though here, in fact, there isn’t one. A brief summary: Nakamura carried out a dubious opening experiment in a well-known position (he was probably creating at the board) and came up against difficulties. Anand could and should have slowly upped the pressure, but he let his opponent off lightly. He missed the opportunity to break away from his current rival, while at the same time the other players weren’t idle! 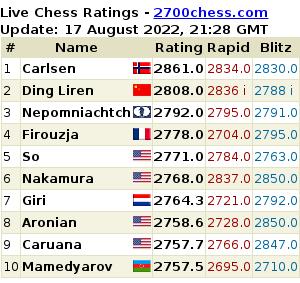 Kramnik has already won (against L’Ami) and caught up with the leaders. Now there are three. The other games are still continuing. Well, thank you, viewers, for your interest in my work. With you was Grandmaster Sergey Shipov. Was, is and will be. See you tomorrow! ARONIAN-related: Why the limit of 10 questions? Any leniency for people who didn’t submit Qs to any previous interview? Do you check the limit of 10 based on name or ip or all? And if it’s only on name, are you dumb enough to not change it after reading this question? Shipov R11: Exchanging pawns on c4 with the white bishop on c1 would simply be a shame. Is it f1 instead of c1? Was hoping to get some coffee, but alas!